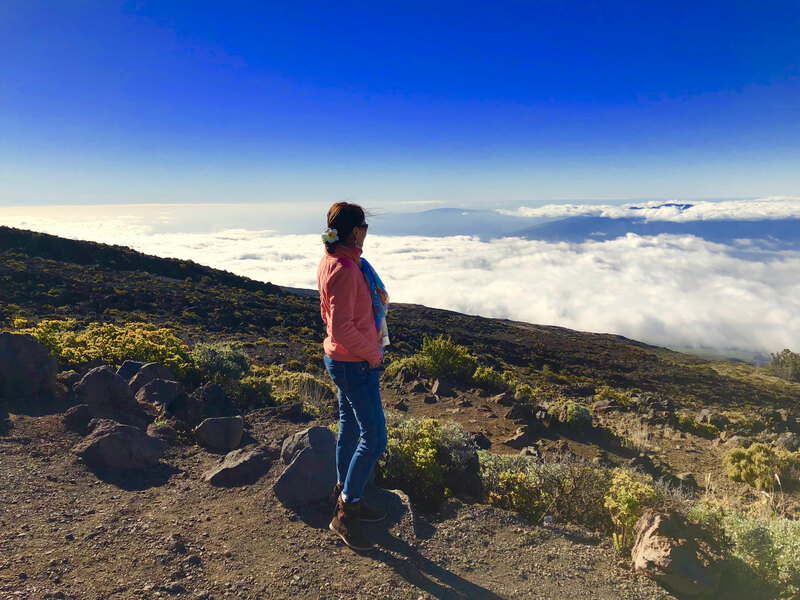 "Looking down to a cloudy North Shore of Maui from Haleakala"
" A significant presence of a feeling or abstract quality: the fundamental substance or constituents of the universe." What I seek to explore and expose are the organic shapes and underlying energies of the natural world as they permeate and meld with these unseen forces of the universe. I am inspired by the shapes and colors surrounding me, and moved by the elemental forces and the unseen urges of their respective "daimons". My work is a purposeful mix of mediums and complex layers. Starting with charcoal and graphite, I sketch my loose designs onto the material, moving with the element of Fire and its electrical energy; the source of strength and drive. Next, using fluid media, the emotion of Water element forms the structure of the relationships and forms created. Using oil glazes, I utilize the element of Wind to subtract, create, and organize the details of forms on the canvas. Lastly, using graphite, colored pencil and pastel, the element of Earth minifests the final details of the substance and life of the work. This technique requires that I let go of thinking and planning and surrender to the silence of raw creative force. Where there is true silence and no words is where the soul speaks the loudest. My path is to be a bridge across that silence; speaking the soul through the language of paint, color and form. Few can put into words the path of the soul. I do it through paint. Although each final piece is primarily the essence of one specific force, all are contained in each--the spirit of Fire, the emotion of Water, the mind of Wind, and the structure of Earth. My performance in painting is like a dance; a coming apart or dissolving, and moving back together into form. The process of dissolution; the breaking down of a substance, is a sacrament. It is the basis of all life and fertility. What is lost in the practice is gained--as all that was before is contained in what remains. "Reality is only silence colored in."